This blog will soon be having it's first anniversary. When I began this blog, I had certain intentions and a possible audience in mind. But for me, blogs are organic and this one soon claimed its own life. My first consideration is to thank everyone who has visited or stumbled here. Thank you for your time, for your comments and possibly, for re-visiting. It's always a wonder to know that someone has taken time to read a posting and even took more time to give feedback. Your visits and comments are always very welcome and appreciated. 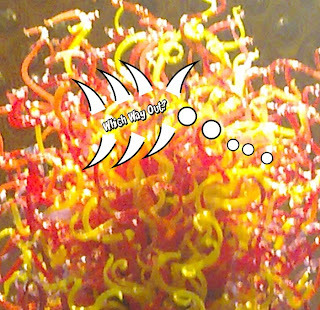 I don't want to convince others now of the role of blogs in education; there are many good reasons (some of which I've pointed out here) and for those who have read entries throughout this blog, will know that I regularly refer to students using a particular tool to then embed in their own blog. So, is there nothing I can share? Nothing that I have learnt through keeping this skybox? One of my initial intentions was to provide students with an example - how else should educators persuade learners if not by taking the first step? This skybox has also been my playground, where I share tools I come across and experiment with. 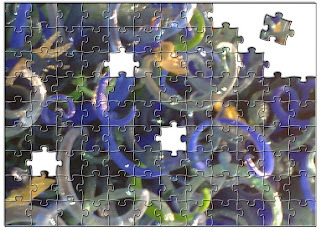 And just like any other playground, it is strewn with thingies, widgets, and visuals. 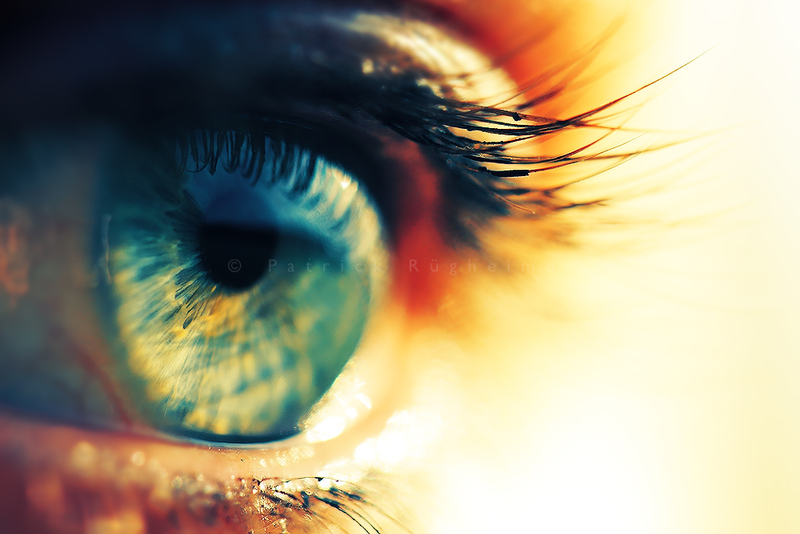 It is no surprise to any visitor that learning visually is one of my characteristics. Speaking of tools, I would like to send a special thank you to Nik Peachey and Russell Stannard, two of the most innovative professionals in the world of ICT, ELT, social media and education and who have most positively and constructively influenced my learning journey. There are too many other educators from whom I have learnt so much over the years to mention each by name, but to all, my sincerest thank you for inspiring and teaching me. It has been a wonder to continue learning, continue discovering and, after so many years in classrooms, still a wonder to begin teaching new courses. I have also learnt that in our blogosphere there are those who take it upon themselves to dictate how blogs should be written and construed. They leave me wondering with their deep, dark undertones to those who do not follow their pearls of dictated rules; if you do not obey, then your blog is destined to crumble and vanish in the far, far cold and dusty ends of the web universe. An end so terrible, that signing your name to a blog posting becomes almost a heresy. But, as in all things in life, there is always light and lightness elsewhere. What else have I learnt? I have learnt that yes, one should listen to those who have much to offer to educators who express themselves through social media. And again, I'd like to point out Nik Peachey's excellent advice in On Blogging and Social Media as well as Nicky Hockly's E-Moderation Station. However, there are many other bloggers and educators who I have learnt from but cannot possibly list them all - to all, thank you for the wonders you share. So where does this all leave me? Write for yourself. Write for your learners. 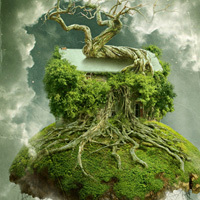 Write with wonder and pleasure. Write for self-discovery, for learning, for wondering. Write with belief. Just like we encourage our students to keep blogs, I strongly encourage colleagues to read and write blogs. There is light and wonder when sharing, when discovering. I've sometimes been asked why I keep a blog which focuses mostly on digital learning tools - wouldn't simply bookmarking be sufficient? Among the different reasons which lead me to keep a blog (as well as several curation sites), I have to highlight the ease it has become to log onto any computer, any system, anywhere, easily accessing links and sites which I consider relevant, interesting or useful. I was fortunate enough to have grown up surrounded by books, magazines and journals. All became part of my immediate day-to-day routine; initially belonging to the elders of the family who shared stories and explanations with me, later these objects of knowledge also became part of my inner surroundings and routines. However, I have also lived in social settings where libraries either did not have the books I wanted to read or where there was no borrowing system as I had grown up with. In some social contexts, there were no libraries and the "bookshops" were places to buy stamps, local newspapers and lighters. Knowledge was restricted from above, beyond what or who I could access. Having experienced both ends of the spectrum regarding access to knowledge, and knowing well how costly professional training can be, we are privileged today to be able to access knowledge so much more easily. At the same time, one can be overwhelmed with the excess of information and sites shouting for our attention. Among the electric tangles of websites, web tools and choices, where can one really begin focusing on professional training and expanding professional insights? Who does one follow for information today? Where does enlightened transformation begin? How can one make sense of it all? Let's consider the introduction of leadership change in the field of management. Instead of a one person leading a herd of buffaloes, leadership change is instigated by the approach of a flock of geese, where each person takes his/her turn to lead and inspire others. It is a flatter approach, more dynamic and consequently, more democratic as different voices are heard, while supporting the leader. The flock of geese approach in management leadership is purely pragmatic and synergetic. In terms of education, we too have options, many which are only a click away. Our choices today are easily more pragmatic and open. There are many leading thinkers and inspirational figures to follow; sharing reflections, points of references and contrasting views has become the norm. Sharing has become today's routine synergy. Professional development today is one's pragmatic choice. Below are some suggestions which may inspire further readings and professional development, helping to make sense of entangled web sites and novelites. 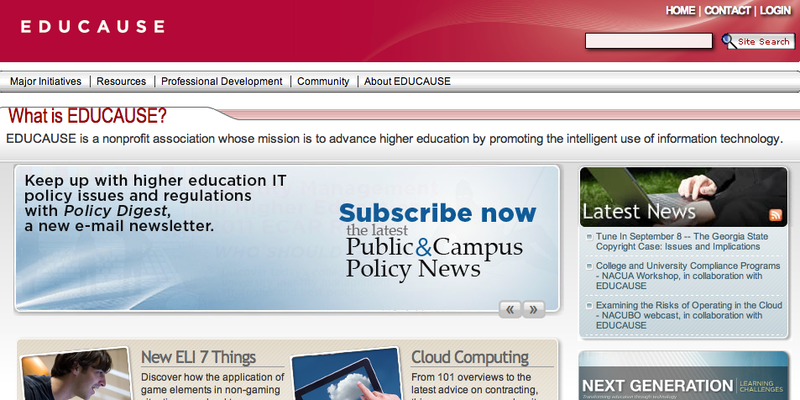 Educause is a great site to keep up-to-date with current affairs regarding higher education and information technology. Educause offers a rich bank of resources and podcasts among other areas of interest. 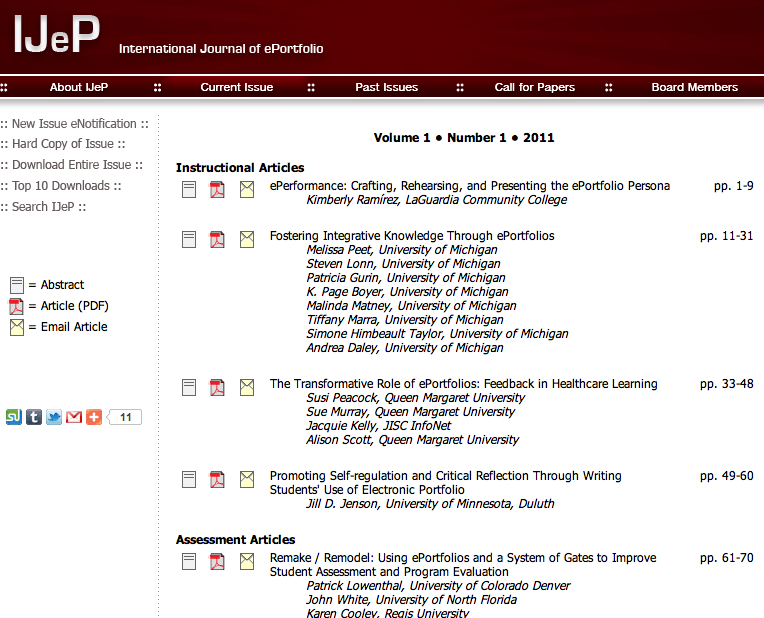 Two E-journals worth browsing are IJeP and IRRODL, which is edited by Terry Anderson. 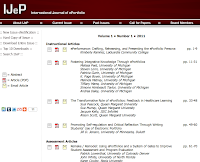 The IJeP (The International Journal of ePortfolio) offers a practical wealth related to eportfolios, while IRRODL is well known for being a leading journal in research pertaining to open and distance learning. 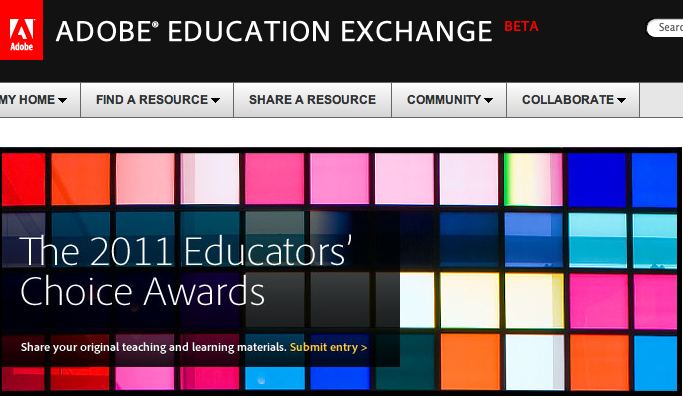 Two other suggestions are the Adobe Education Exchange and the Research Gate, both offering networking and resources for educators. 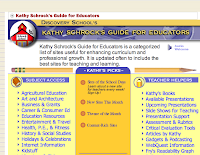 Kathy Schrock's site for educators is yet another place where educators (especially those working in K12) can find ideas to enhance curriculum and professional growth. These are some sites which help me make sense. Today, I still appreciate bookshops and libraries but am no longer strictly dependent on my social surroundings to access information and new perspectives for professional development. Today I engage in synergetic sharing, giving and receiving. Today my inner routines of knowing and knowledge are public and transferable. How do you make sense of entangled sources of information for personal and professional development? Learning comes naturally to us all. Whether learning how to use building blocks or climbing a tree without tumbling, learning is part of the symphony of being human. 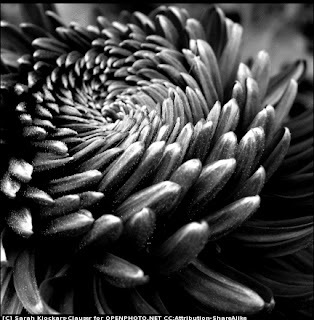 And like a symphony, there are movements; moments of exchange, exploration, experimentation. Education Eye is a map of movement for educators. 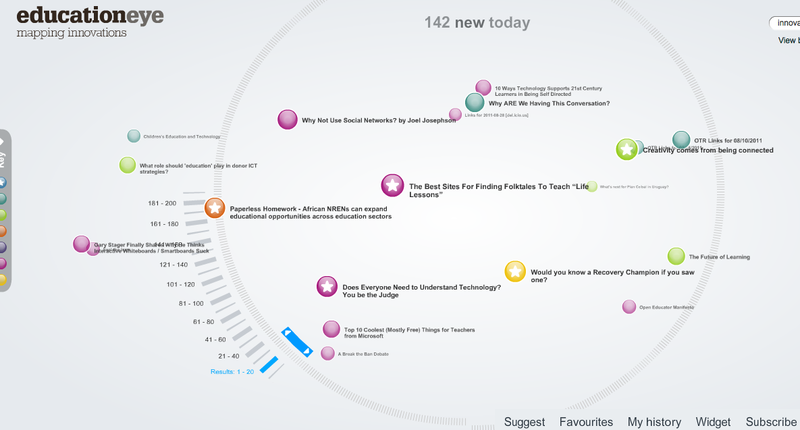 As you can see on the right, the site begins with a map which offers the latest articles related to education and innovation. If you click on the key on the left, you can select your own interest - from editors choices to articles on inspiration, to practice and research. You will also notice how some articles are ranked by stars and different colours; as you click on each article, a brief summary of the article and writer will pop up, making it easier for the reader to choose whether they want to read it or not. 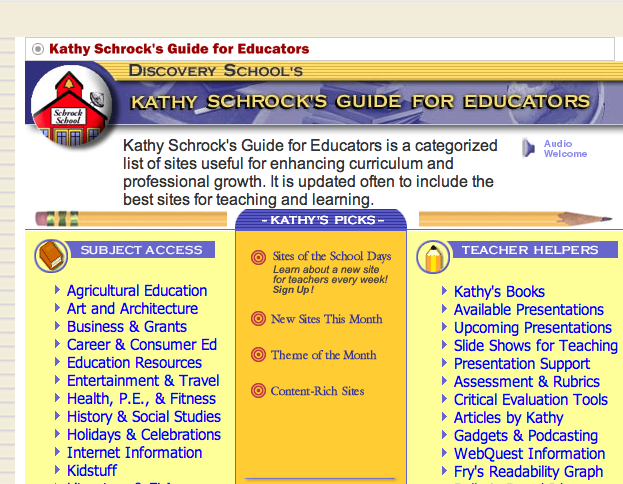 Overall, a most interesting map of movement for educators to browse and explore. 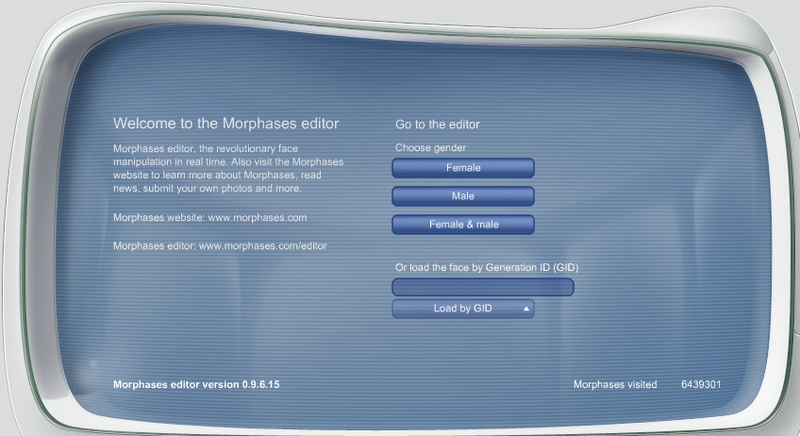 Morphases is a site which manipulates faces, making interesting and novel avatars. In some countries, displaying one's real face online is unacceptable, so using an avatar to join a network or post online is much more appropriate - not to mention fun as well. 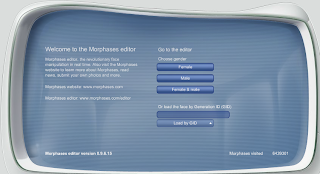 If you would like to see more options on creating avatars, have a look here, where there is a selection of avatar creators which I have collected. I'd like to especially point out Sylvia Duckworth's very comprehensive list of avatar makers. Sharing learners' work has never been easier. One can begin by putting up students' work on classroom walls and then transfer them to a book online. 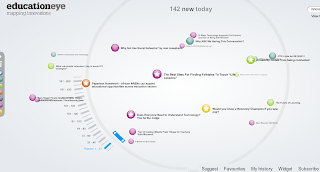 Bookemon is yet another wonderful way to have learners publish and share their work. Learning is a movement. And all movement should include elements of fun. Random Poem Generator does exactly what its name says - it generates poems from URLs. Here is an example which created a haiku from Mind Mirrors. Random Poem Generator offers 3 choices of poem formats and once it has generated your poem of choice, will also offer an embedded recording. Possibilities are endless: learners can select their favourite site, a news site or even generate a poem with lyrics of their favorite band. 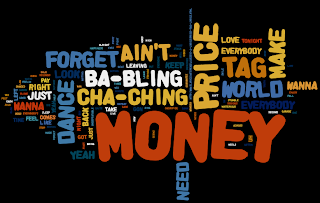 (Lyrics N Music is one among different sites where you can find lyrics). Learning movements. As in all symphonies, there are moments of allegro, adagio, scherzo, rondo. Learning may be serious, exam-oriented and "academic"; at times, ludic, playful, motivating one to explore and experiment. 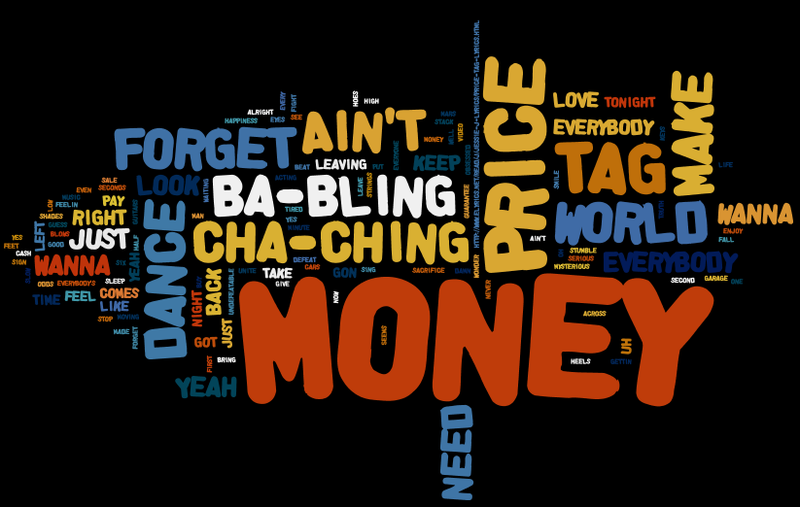 It's not about the bling. It's about making the world dance. How do you make your students' learning process turn into a symphonic movement?